A rounded shrub with lacy, cutleaf foliage. 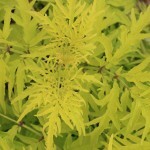 The new growth is tinged red, maturing to bright yellow to chartreuse. Spring flowers are white, with red fruit in the fall. It takes full sun in cooler areas, prefers part shade in southern climates.